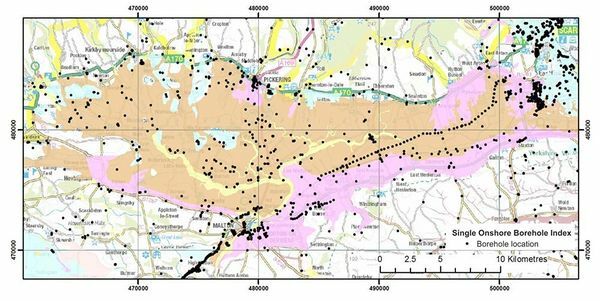 Within this section of the report, the availability and type of geological data within the Vale of Pickering is reviewed. The Vale is largely covered by the Pickering 1:50 000 scale provisional series geological map sheet. The current map was published in 2000 and is based on the original survey published in 1882. It was updated for the 2000 publication through re-survey in the western margin and the consideration of borehole data. Digital geological linework is available at 1:50 000 (Figure 3), however no digital 1:10 000 scale data exist. Figure 3 DiGMap50 superficial geology for the Vale of Pickering and surrounding area. The range of superficial deposits shown on the Pickering 1:50 000 scale provisional map sheet is shown in Figure 4. 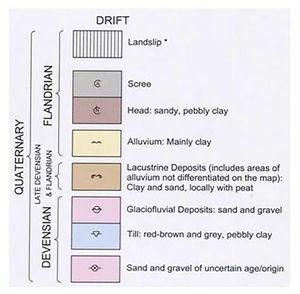 Figure 4 Key to the superficial deposits shown on the Pickering 1:50 000 scale provisional map sheet; not all of these units are recorded in the Vale area. BGS holds around 900 borehole records for the Vale (Figure 5). These range considerably in age, depth, detail and distribution. An initial assessment of selected boreholes (described below) indicates that only around 50% contain useful information on the superficial geology. Figure 5 Borehole distribution based on BGS Single Onshore Borehole Index (SOBI). The BGS Advanced Superficial Deposits Thickness Model (ASTM) (Lawley and Garcia-Bajo, 2009) offers coverage of the Vale. This model uses borehole thicknesses and Quaternary map limits; rather than interpolating superficial ‘thickness’, each data point is compared with a digital elevation model (DEM) and the elevation of the point of rockhead above sea-level is calculated. The rockhead ‘elevations’ from the boreholes and map margin are then interpolated across the entire map area to create a rockhead elevation model (Figure 6). This model is then subtracted from the DEM to derive a thickness model (Figure 7). Where no superficial deposits are present (i.e. where bedrock is mapped directly beneath the ground surface; white areas on Figure 6 and Figure 7) the rockhead elevation is equivalent to that of the ground surface. Figure 6 BGS rockhead elevation model; colour ramp ranged to highlight local variation. Figure 7 Advanced superficial thickness model (ASTM); colour ramp ranged to highlight local variation. Both models indicate that the central axis of the Vale corresponds with the area of deepest/thickest superficial deposits, reaching a maximum modelled thickness of around 35 m. The model shows several prominent anomalies, including a large depression in the rockhead surface around 6 km to the southeast of Kirby Misperton. Such anomalies may be associated with a change in lithology (i.e. the possibility of coarse-grained saturated sediments) or the preservation of older (i.e. concealed) deposits that may not be represented by the surface geological map. As noted above, a proportion of the borehole information available to BGS in the Vale contains useful information on the superficial succession or thickness. The distribution of borehole data used to constrain the ASTM and rockhead models is shown in Figure 8. The data includes boreholes that prove rockhead as well as those that terminate above rockhead and provide a minimum thickness to the superficial succession. The linear and clustered nature of these data points and gaps in data coverage highlight the relative level of confidence that should be associated with these models. Similarly, the provisional nature of the published geological linework indicates that the mapped extent of any superficial deposits may be locally uncertain. These factors should be taken into account when considering the rockhead and superficial thickness model outputs. Figure 8 Map showing the distribution of borehole data used in the ASTM and rockhead models. The cross-sections reported as part of this study have been constructed independently of the ASTM. The superficial thickness indicated by the cross sections, are based on a different set of borehole information to the ASTM (Figure 9). They incorporate a considerable amount of geological interpretation that is informed by the geologists’ tacit knowledge and conceptual understanding of the local geology. Hence, the range of superficial thickness suggested by the cross-sections differs from that given in the ASTM model. Correspondingly, the depth and geometry of rockhead presented in the cross-sections (as red lines in the corresponding figure below) differs from the model in several areas. The construction of further cross-sections may allow a refined ASTM and rockhead model to be produced. Figure 9 The distribution of borehole records considered as part of this study.